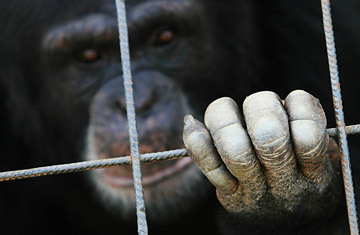 Spain's parliament is poised to pass a bill granting human rights to great apes such as chimps, gorillas and orangutans. Dissonant though it may be, on June 26, the environmental committee of Spain's lower house of parliament approved a resolution supporting the Great Ape Project, an organization and manifesto founded by ethicists Peter Singer and Paola Cavalieri, which argues that three essential human rights  life, liberty and freedom from physical and psychological torture  should be extended to our closest hominid relatives. Joan Herrera, congressman for the Catalan Green Initiative party, justified the measure before parliament, saying that the primates "are capable of recognizing themselves, and have cognitive capabilities." Bull rights? Here in the middle of bullfighting season, when each weekend brings the bloody ritual slaughter  for sport or for art, depending upon your point of view  of more toros bravos, those animals appear to have precious few rights at all. But more to the point, the difference in treatment underlines the contradictions laid bare by Spain's recent and frenzied catapult into modernity. The resolution is one more way  along with gay marriage, secularization, and gender parity  for the Spanish government to demonstrate its newfound progressiveness. That progressiveness is not, by and large, imposed  the majority of Spaniards support all those measures. But the majority also still get married in church, have Sunday lunch with their parents, baptize their children, and spend a summer week in the pueblo from which their family came. Tradition, in other words, still matters. And for many, bullfighting remains a powerful sign of identity. "It's part of our social genome," says Luis Corrales, president of the Platform for Defense of the Bullfight. "It gives us a sense of who we are as a people." That may be changing  one poll puts the proportion of Spaniards opposed to bullfighting at 80%  and animal rights proponents here like to point out that just because something is traditional doesn't make it right. Still, activists on both side of the bullfighting fence agree that, at least for now, a law banning bullfighting is unthinkable.